This page has officially been approved by Emperor Zim. Now shut up your noise tube and read the article, filthy human pig-monster! A spy has many body parts, not found in perfectly normal human wormbabies. Such as permenant sunglasses. They never leave his face, ever. It is so hard to remove, all operations done on the spy would fail (and kill him obviously). 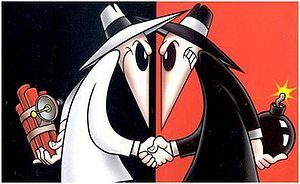 Spy vs. Spy is a comic that has, ironically, nothing to do with espionage besides the fact that the main characters occasionally fight over files marked TOP SECRET. They are so bad at spying, they should be terminated on sight. They are exactly the same exept the color of their uniforms. They are are crazy and are interested in killing each other. They have plenty of weapons, if it's deadly, they have it, and for the purpose of killing the other "spy". They are in conclusion, sadistic nuts. Brain washing is the international hobby of spies. They often, for sport, kidnap people, take them to secret locations, brainwash them, then brainwash them again so they don't know they've been brainwashed, then brainwash them again so they don't know they've been brainwashed, then brainwash them again so they don't know they've been brainwashed, then brainwash them again so they don't know they've been brainwashed, etc.